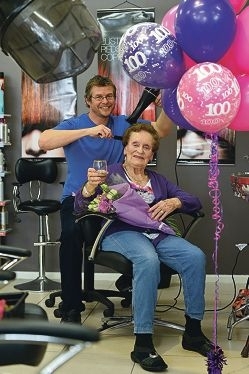 Loyal customer Julia Gibson celebrated the milestone recently and the Mt Hawthorn salon delivered on its promise. Ms Gibson has been getting her hair coloured, cut and set by salon owner Jonathan Griffin for the past 20 years and said she felt no older than the first time they met. ‘I don’t feel any different, I feel just the same,’ she said. Born in Wales on September 11, 1914, Ms Gibson arrived in Perth in 1921 with her three sisters and has been a Mt Lawley resident for about 60 years. She married her husband Tom in 1940 and the couple had no children. However, she has several nieces and nephews who enjoyed helping her celebrate the special birthday. Mr Griffin said he felt privileged to have Ms Gibson as a client. ‘We have a huge mixture of clientele ranging from one year old to 100 years old,’ he said.